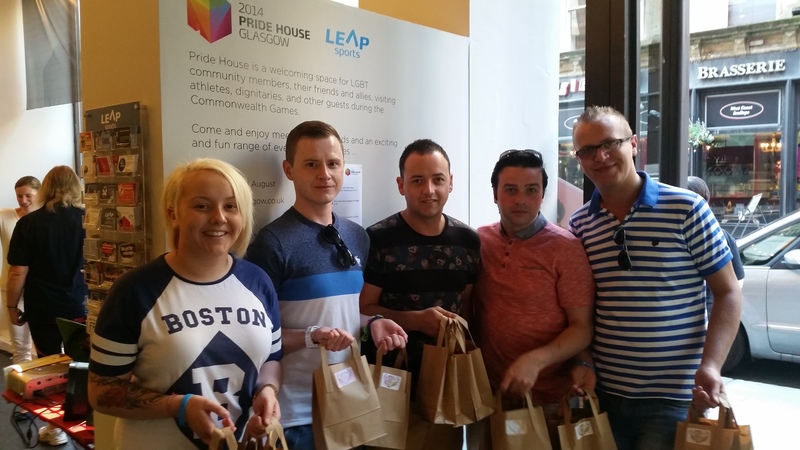 LEAP Sports > News > Pride House Glasgow needs you! Pride House Glasgow needs you! Pride House Glasgow is taking place again this year for the Homeless World Cup between 9th – 16th July. You can read more about the project here. For the project to be a success, we need lots of volunteers to be able to make it happen, and with only a few weeks to go, we are still around 15 volunteers short of our target. If you are free anytime between the 9th and 16th July, even if that’s only for a couple of hours, then we’d love to hear from you. You can sign up here and let us know what you are available for. There will be training and briefing sessions for volunteers as well as lots of interesting and exciting events for you to get involved in. I had originally applied to be a Clydesider and when I wasn’t successful I didn’t think I’d be able to really get involved in the Games. Getting involved in Pride House not only allowed me to contribute to the Games and to an agenda that I’m extremely passionate about, but I had the best time of my life, I want to do it all over again. I gained more confidence in dealing with the public. I enjoyed meeting new people and getting involved and I learnt a lot more about the wider LGBTI community. Pride House has been a great opportunity to meet new people, make new friends and engage further with the LGBT community in Glasgow. Pride House was just really simple, straightforward good fun. I really enjoyed meeting the other volunteers most of whom I would be really unlikely to have met otherwise. You can also get in touch via info@leapsports.org if you have any other queries. Written on 25th May 2016.